Jiri Siklova and his son Jiri shared some of their pre-war vintage glass stock with us when we visited them in December 2017. In spite of the limitations of emails between parties who think in different languages - the glass and finish choices for the first two pressings of our exclusive Boho Bizons were not lost in translation. The entire Sikola family - Jiri, Ivana, Jiri and Eva in Jablonec - were involved in the process. It wasn’t as simple as picking out a couple of Crayolas. Glass rod colors in Jablonec are limited by availability. The Sikolas have an amazing collection of current and vintage glass rod stock, but the more special the glass, the harder it is to describe. I had ideas of what I like, but didn’t have the experience to understand which glasses could be blended or how the various finishes with work with different glasses. So we shared images and ideas about my Buffalo. I emailed dozens of local images and sent a box with local books, brochures and sponge candy. In the process, we realized how much Jablonec and Buffalo are alike. Our lake is bigger, their mountains are higher. But we are four season towns that embrace each season. We revel in our gardens, play hard in the summer, marvel at the the color of the hills in the fall and ski and skate through the winter. We don’t hide from the weather , we embrace it. We are hearty, hardworking , family-centered and appreciate sports. A couple months later Jiri and his sister Eva took pictures of the first pressings against a neutral background in the natural light of their snowy driveway. i was even more excited than they were were I opened the email. I couldn’t yet imagine how much the finishes would burnish the beauty of our project. Seven months after sharing cookies and ideas with the Soklova’s the first herd arrived in Buffalo - the same day as our grandson Landon’s first visit to Buffalo. He immediateely joined his grandfather inspecting the new product — and clearly liked the color choices. I knew I wanted the sharp relief of our mold have subtle sparkle of the tradtional Aurora Borealis finish on one side and simple glass on the other. I loved all their other work with black, Picasso, brass, silver and gold finishes — and realized that matching it all up would be best left to senior Jiri and Ivana’s discerning eye and experience. It turned out to be the best choice I made. When I opened in first shipment in July I saw days on Lake Erie at the cottage, the soft shine of a snowy night and all the hues of our sky. Lesson learned, I put all color and finish choices for the the next phase of their special table cuts completely in their hands. Again they delivered my Buffalo in the form of our Bizons. Their passion for the project and interpretation of my Buffalo was one of the most satisfying experiences of my life. It’s my privilege to share these special pieces exclusively with my customers. It’s my fondest hope that the Siklova’s can visit us in Buffalo someday and find out just how right they got it. The photos below show all the designs to date. Click on the image for more detail. A couple of things to keep on mind. All the pieces have the bizon image on both sides - only the Ice group have finish on one side. Remember these are artisan pieces , glass color and finishes may not be the same from piece to piece or side to side. I match them for earrings and other places it’s necessary for design purposes, but expect beautiful and distinct variation. 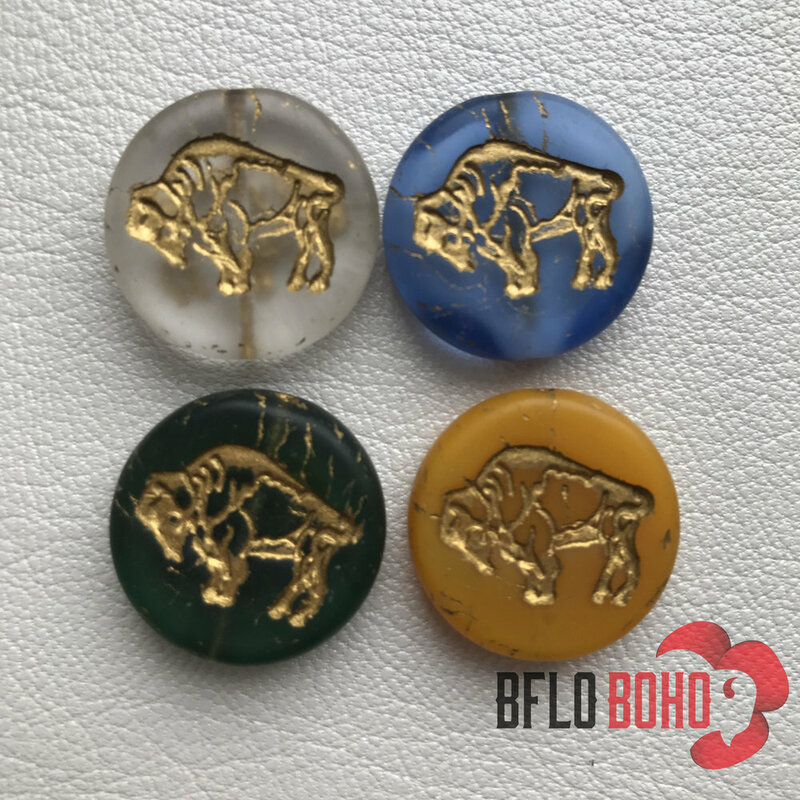 The number made of each and cost of production varies by color, blend and finish so it isn’t possible to simply to pick out a design and ask to have it redone a medallion design that grabs you. The search function on the site allows you to put in the color or name of each medallion to pull up all that is currently available. First picture sent of the first pressing. - before many weeks of finish and polish and polish ahead. Knowing how much beauty the family creates daily, it was especially fun to share the enthusiasm of the younger Siklovas as we moved through the stages of the project.